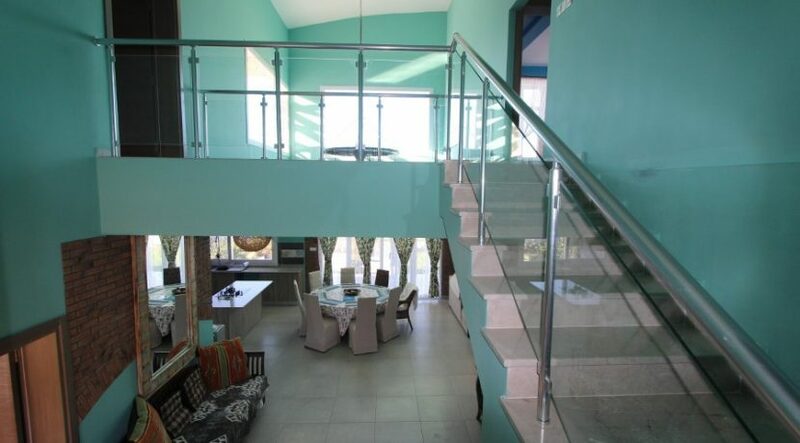 TATLISU BEACHFRONT – designer dream home * 2nd row to frontline * Fabulous SEA & MOUNTAIN VIEWS * 5 bedroom, 5 bathrooms (3 ensuite) * Large 1000m2 landscaped plot * Peaceful, exclusive location * Palatial, key-ready, 274m2 upgraded modern villa * ABSOLUTELY UNIQUE designer interior to show-home standard * HIGHEST BUILD QUALITY available in North Cyprus * Brand new kitchen fitted kitchen, granite worktops, central island * All WHITE GOODS/ACs included * FURNITURE by negotiation * Separate UTILITY ROOM * MARBLE staircase, WOODBURNER * Overlooking shared POOL * Private swimming jetty * Luxury site pool & relaxation area * Children’s play area, outside gym * Easy access to KARPAZ sandy beaches & new marina * Huge HOLIDAY RENTAL/ investment potential * 18 MIN GOLF COURSE * 35 min KYRENIA * MUST BE VIEWED to appreciate the design, quality, size & views of this fabulous villa * Call NCI in UK and Cyprus on +44 207 112 8086 or +90 548 861 0600. 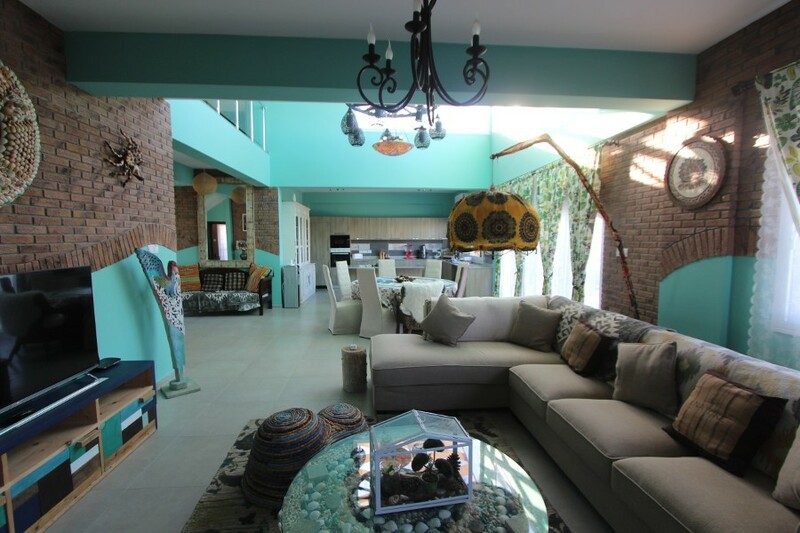 Tatlisu Dream Home – Rare opportunity to acquire a palatial, 5-bedroom villa in 1000m2 plot with unique, designer interior, offering fabulous lifestyle & holiday letting potential in peaceful beachfront location. 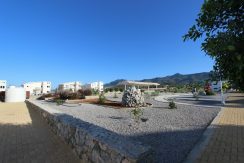 If you are seeking a large key-ready villa on an exclusive beachfront site, then don’t miss this opportunity! 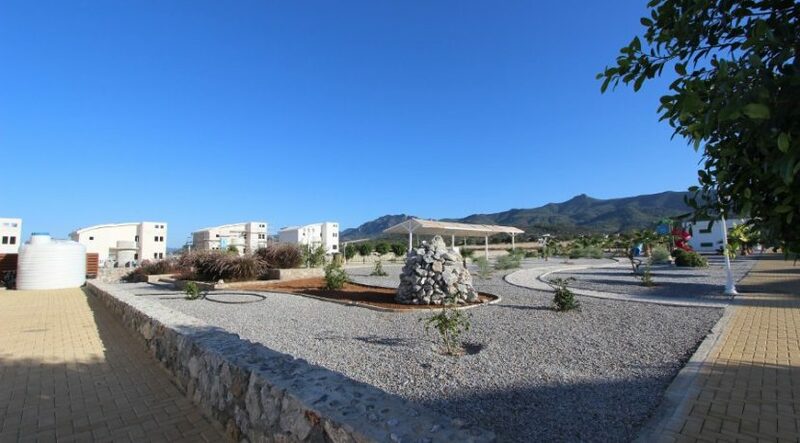 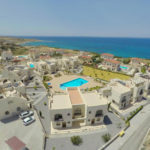 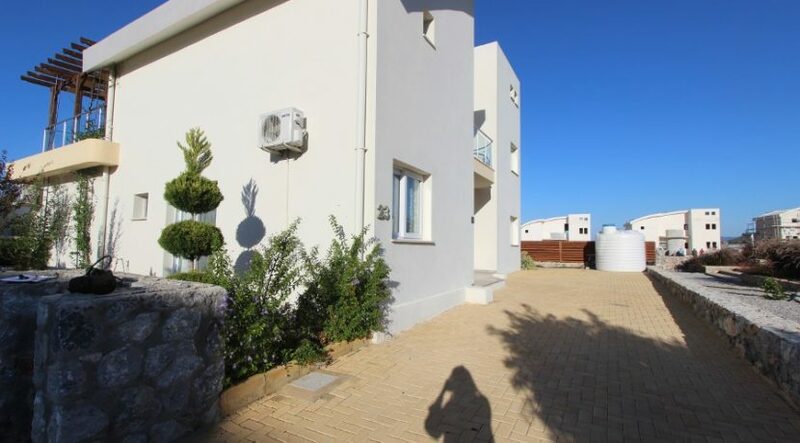 Achieve your dream North Cyprus residence or holiday home in this totally unique, key-ready property with direct sea views and generous private driveway with parking. This villa can’t be beaten for size, position and finish – completely suitable for high-end vacations or all-year living on a generous 1000 m2 plot located right next door to the swimming pool. 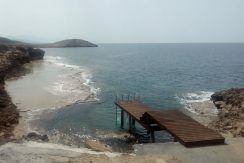 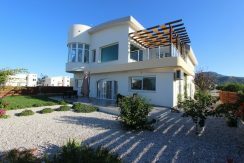 The villa owners on this exclusive site have access to a private swimming jetty, outdoor fitness area, large peaceful shared pool and all enjoy fabulous frontline sea views set in a peaceful country area yet only minutes from nearby facilities, 18 minutes to Korineum Golf Club and 35 minutes’ drive from Kyrenia. 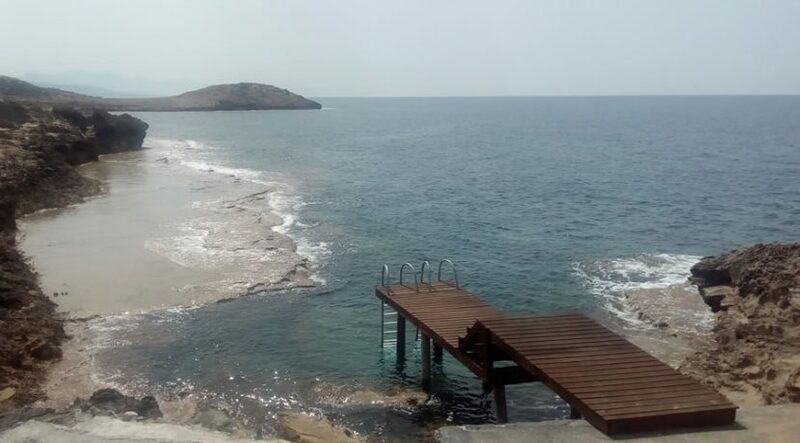 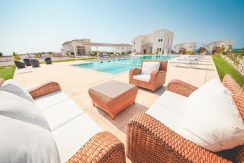 Please note, as many of the other villa owners have private pools, the shared pool is extremely peaceful and conveniently located next door to the villa. 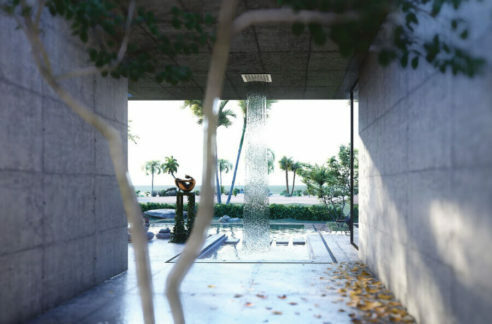 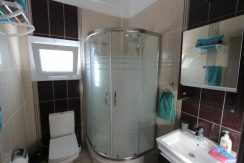 There is of course space for an additional private pool to be added at extra cost if required. 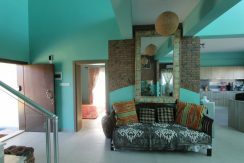 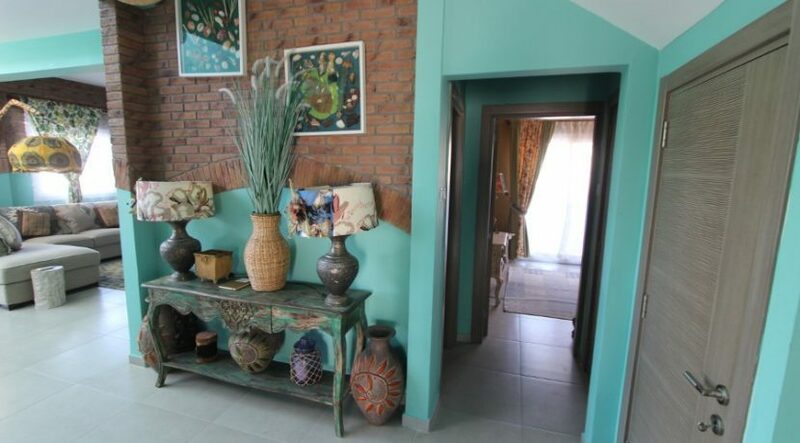 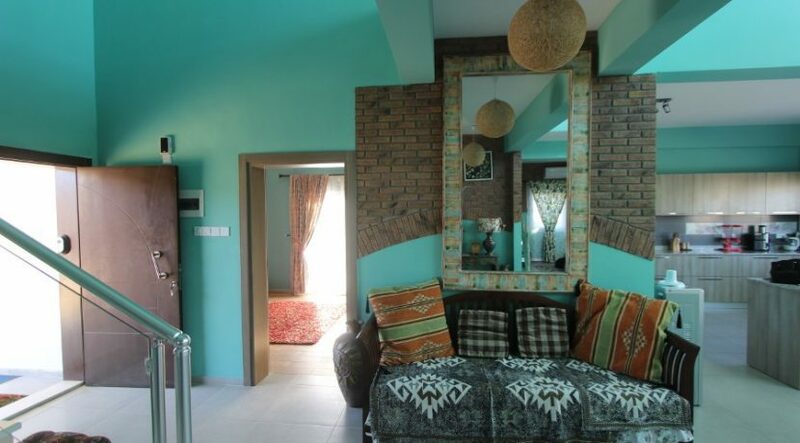 Entering the front door, you are immediately struck by the unique brick feature wall design throughout and by the fabulous Mediterranean colour schemes. 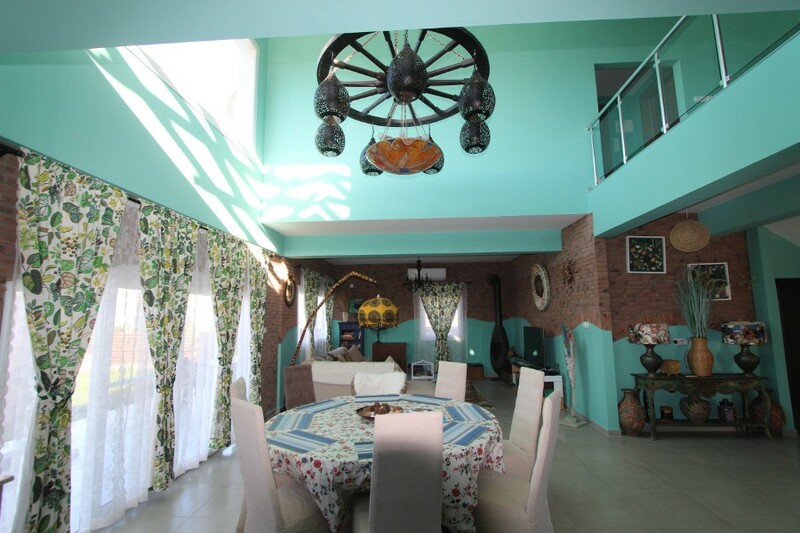 Immediately ahead is the dining area with kitchen to the left and spacious living area to the right. 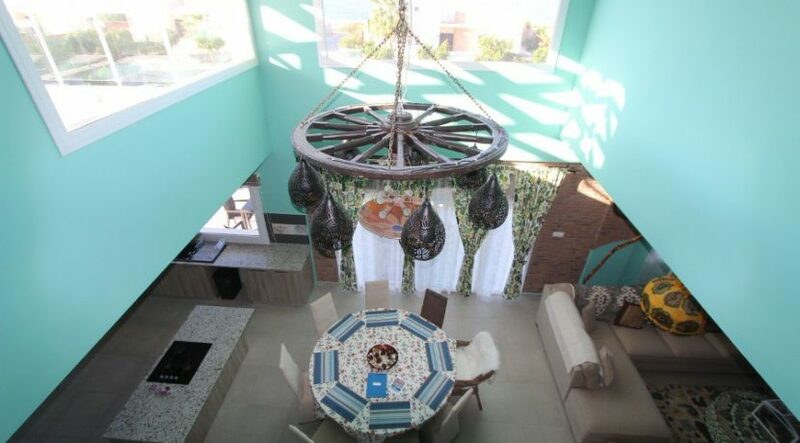 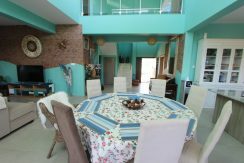 There are sea views from the kitchen and living areas. 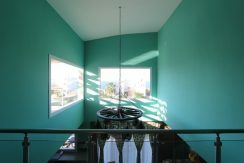 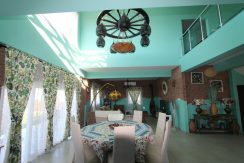 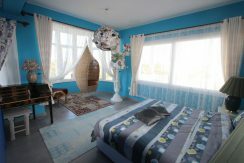 At the far end is a large French window with sea view and access to the garden area. 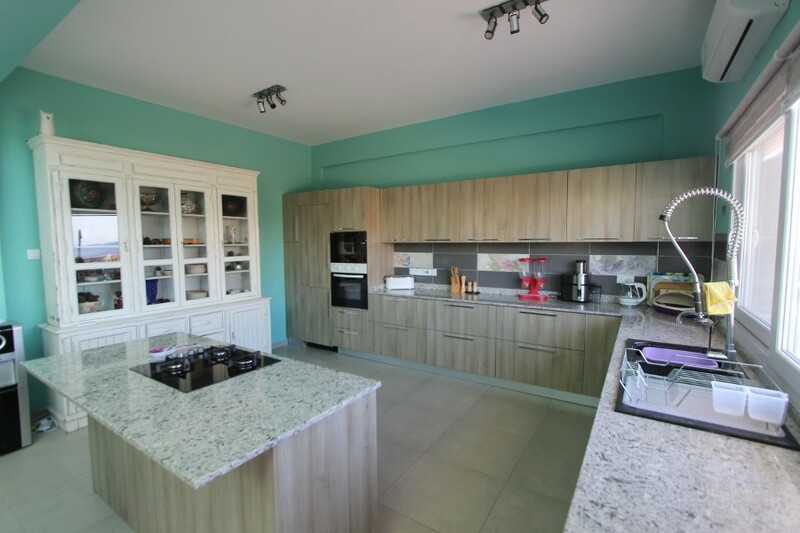 The fabulously upgraded kitchen is open plan to the dining area offering a brand-new range of high quality units, central island and all appliances. 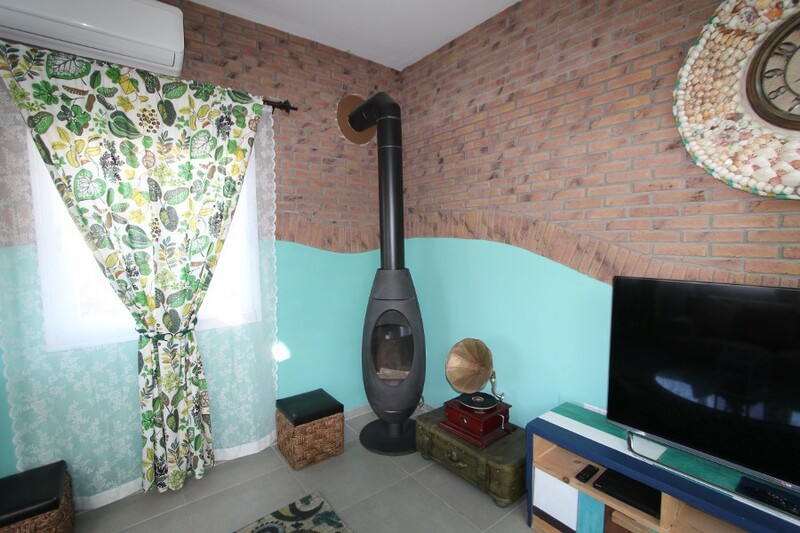 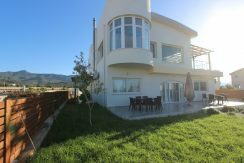 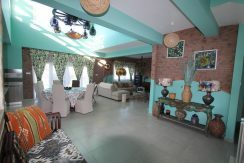 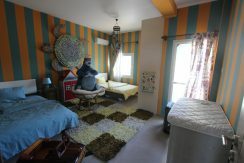 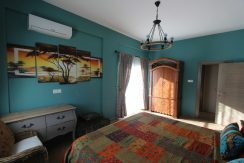 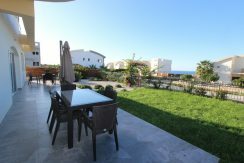 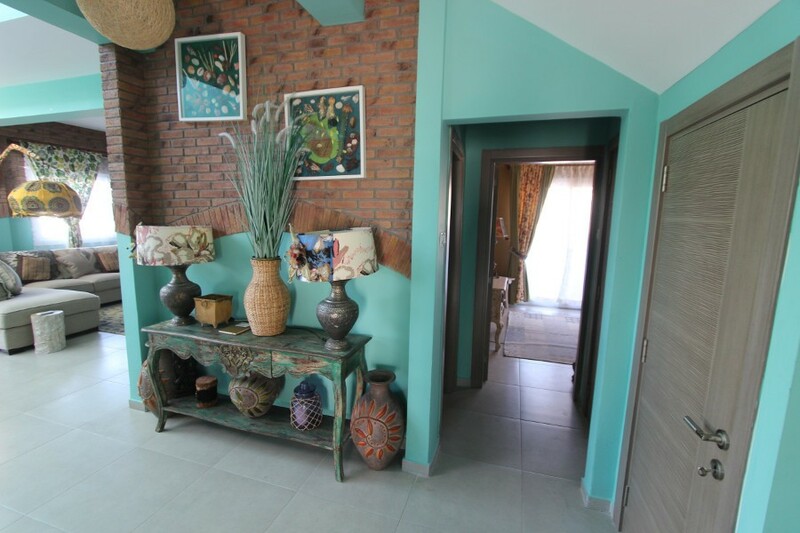 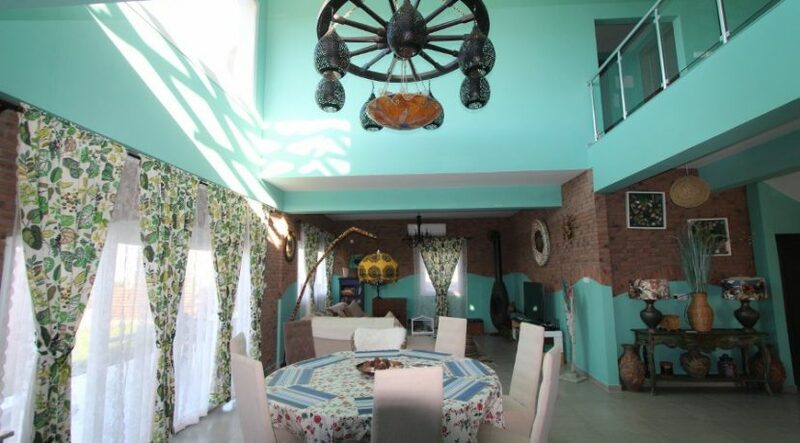 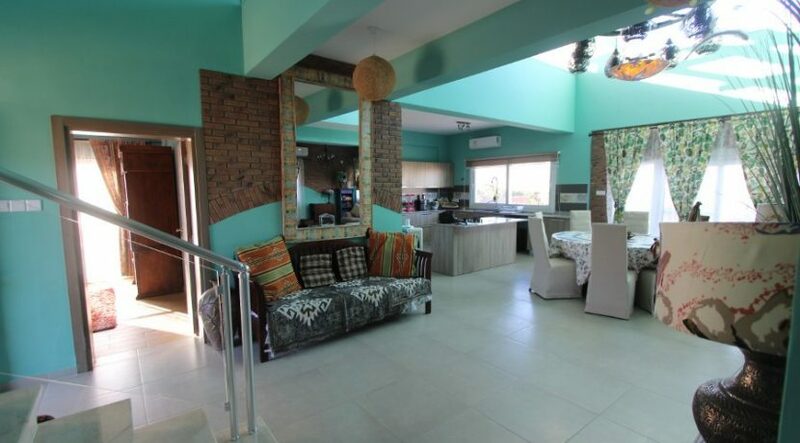 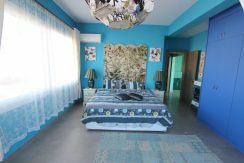 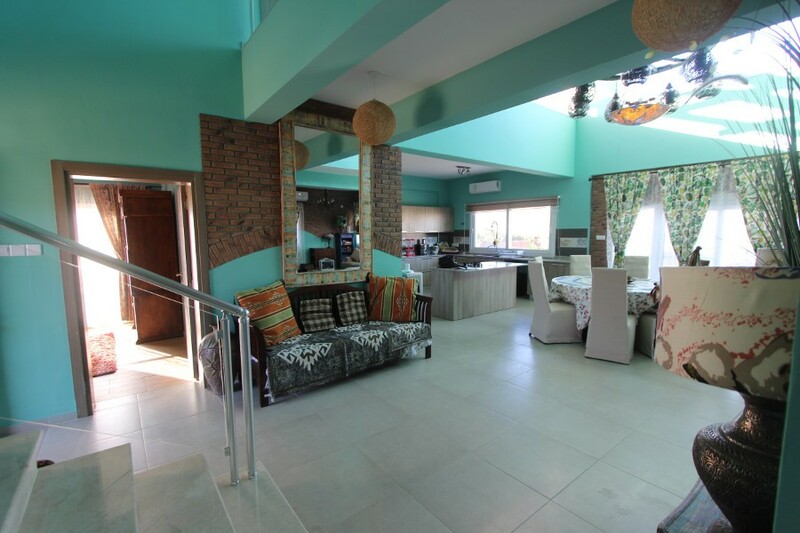 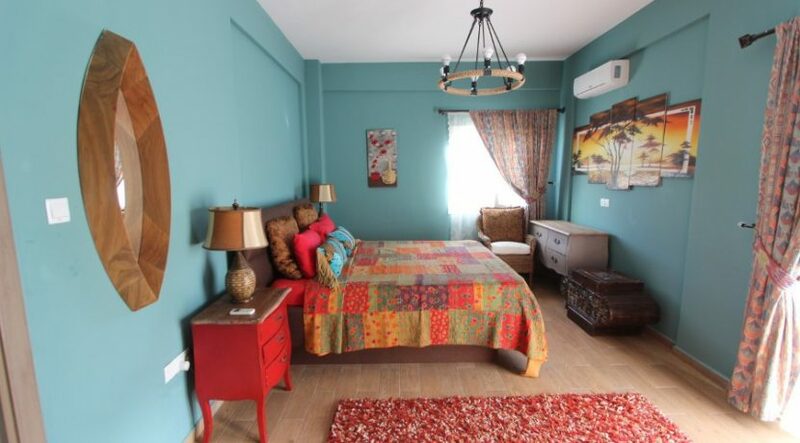 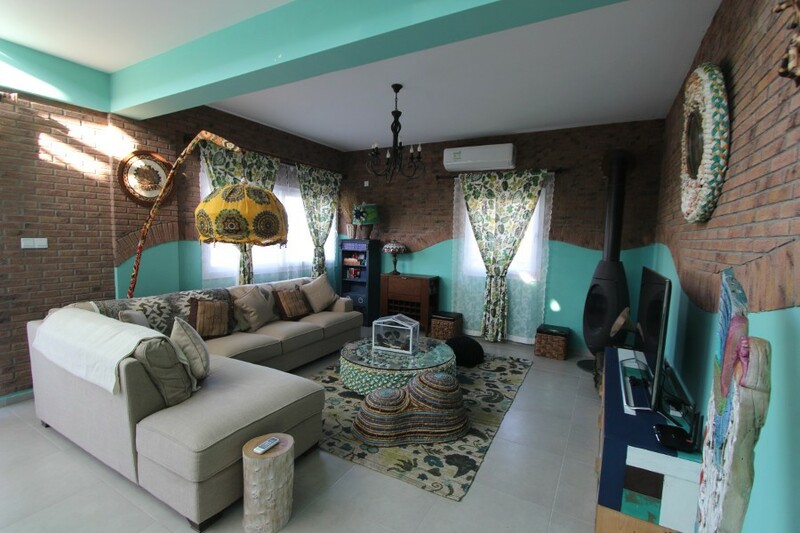 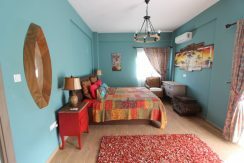 The huge living area with log burner is beautifully & uniquely furnished offering the highest standard of lifestyle available in North Cyprus. 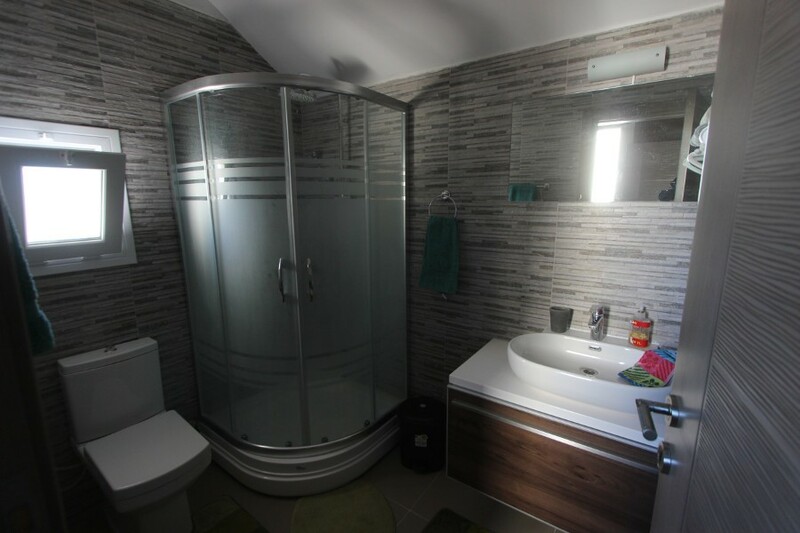 To the left of the entrance is the first of the two downstairs bedrooms with ensuite shower room, sliding doors to the side garden, fitted wardrobes, air con unit & tiled flooring. 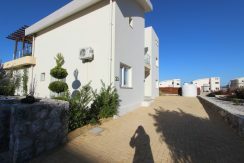 To the right of the front door is the second downstairs bedroom also with ensuite shower room, and also with sliding doors to garden. 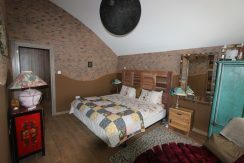 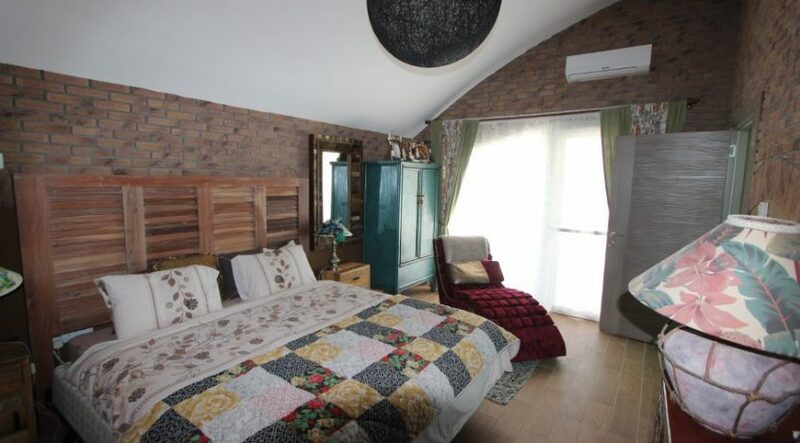 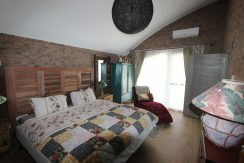 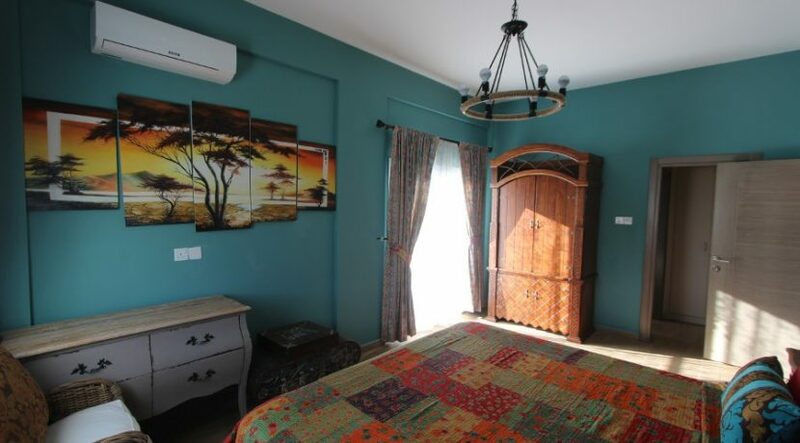 All bedrooms offer generous fitted wardrobes and the two downstairs bedrooms give huge scope for private guest accommodations or for any family members with mobility issues. 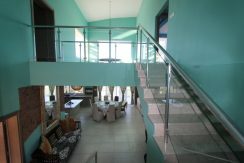 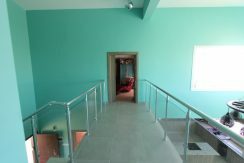 The staircase beside the front door rises to a unique suspended bridge landing over the living area with fabulous sea views and glass/aluminium railings. 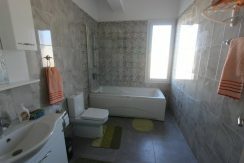 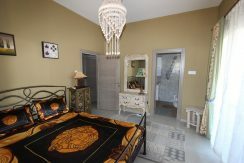 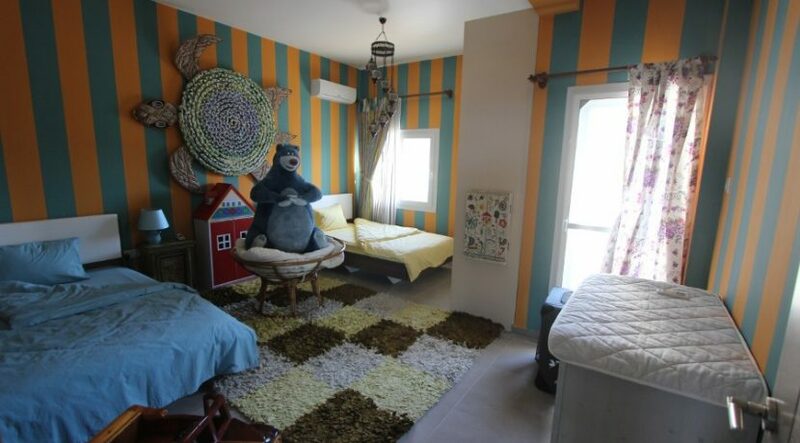 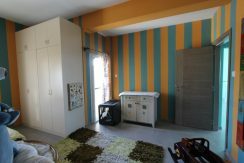 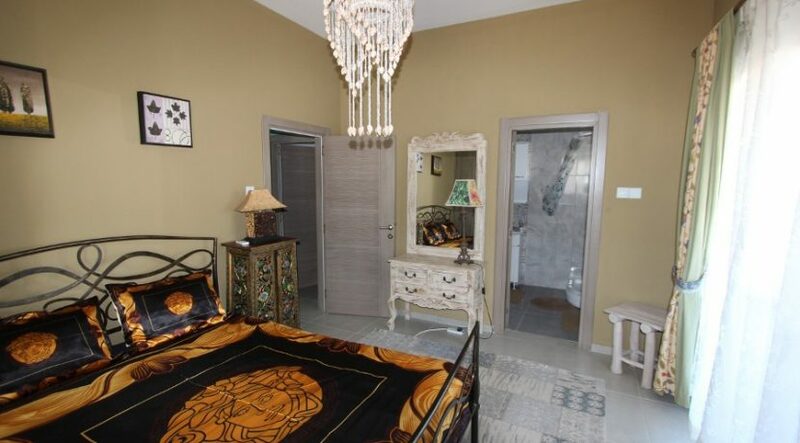 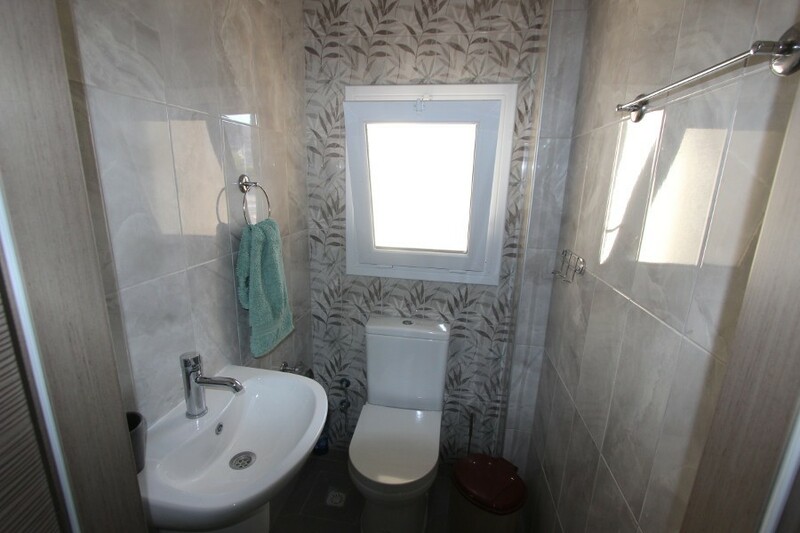 On the right are found two bedrooms sharing a central bathroom. 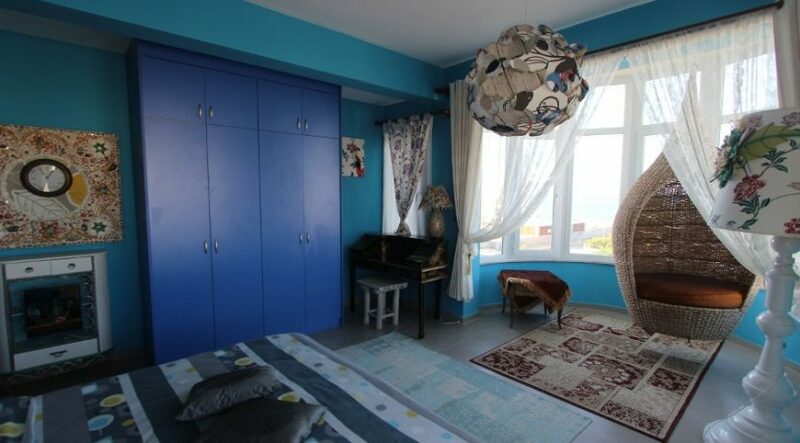 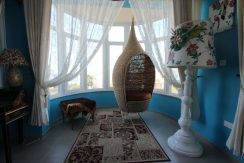 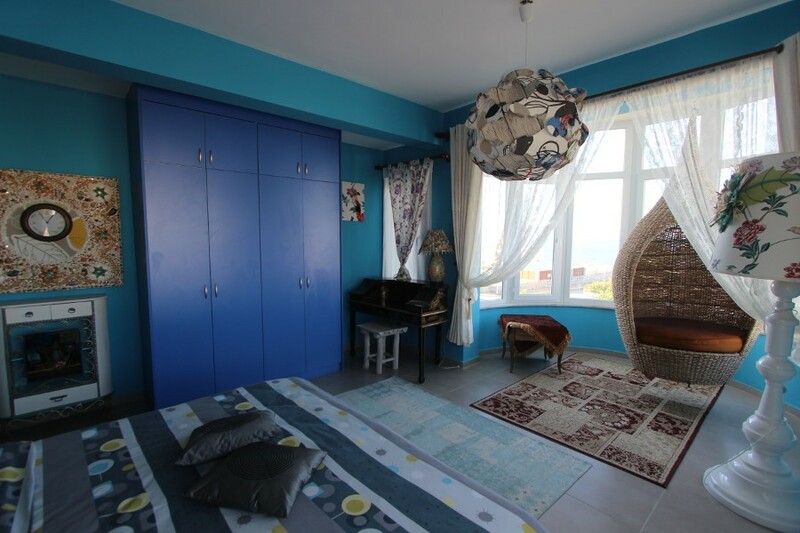 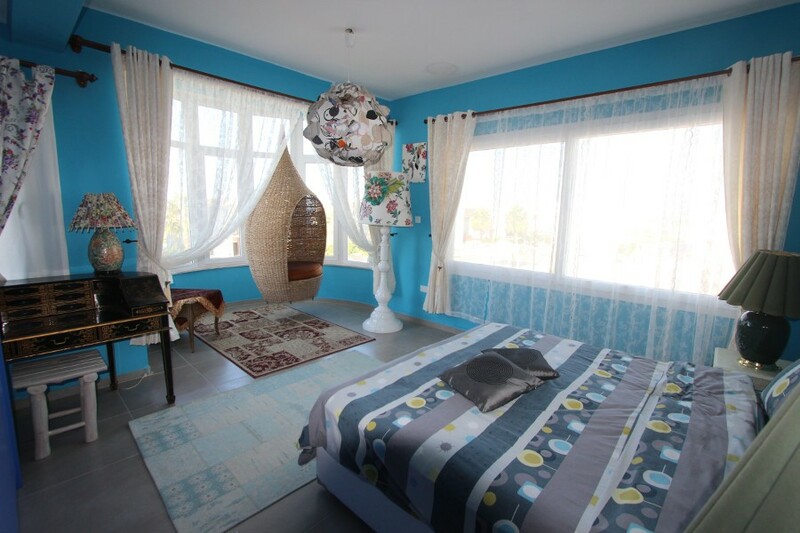 The front bedroom has fabulous curved sea-view picture window plus extensive wardrobes. 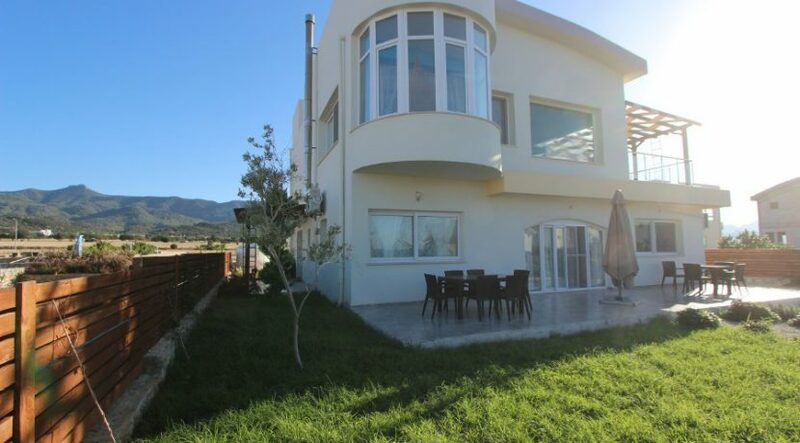 To the left of the top landing is the fifth bedroom with ensuite shower bathroom, laminate flooring, fitted wardrobes and private balcony offering panoramic sea and mountain views. 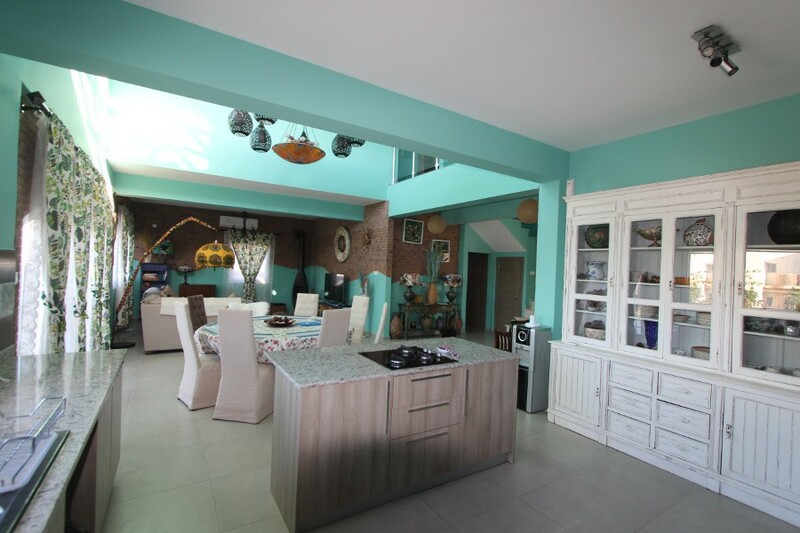 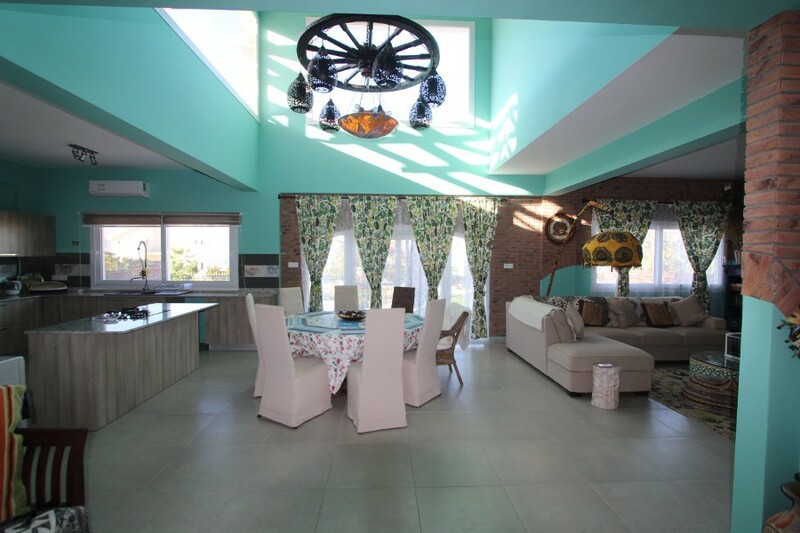 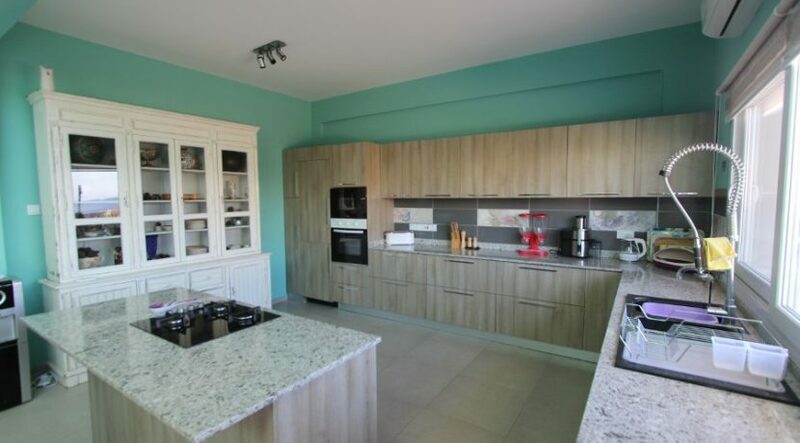 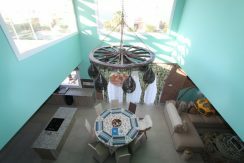 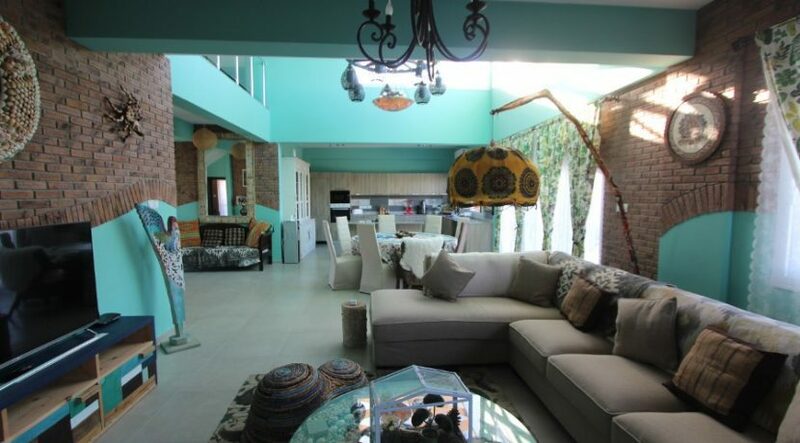 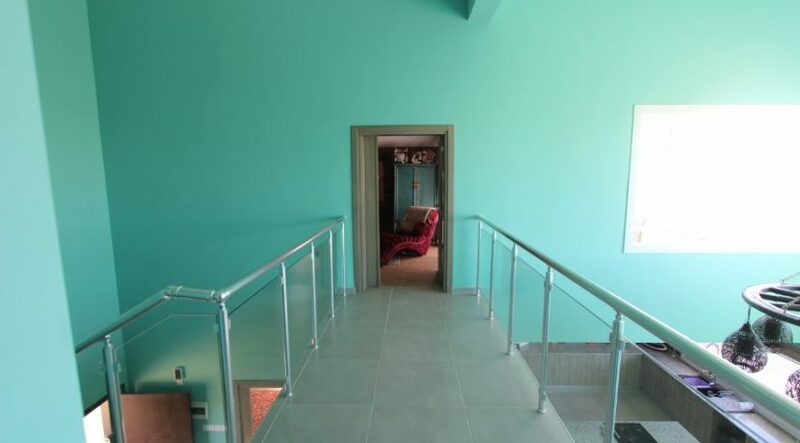 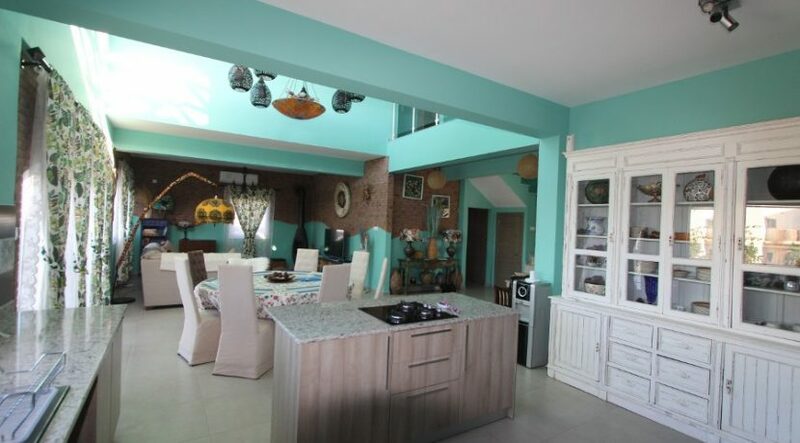 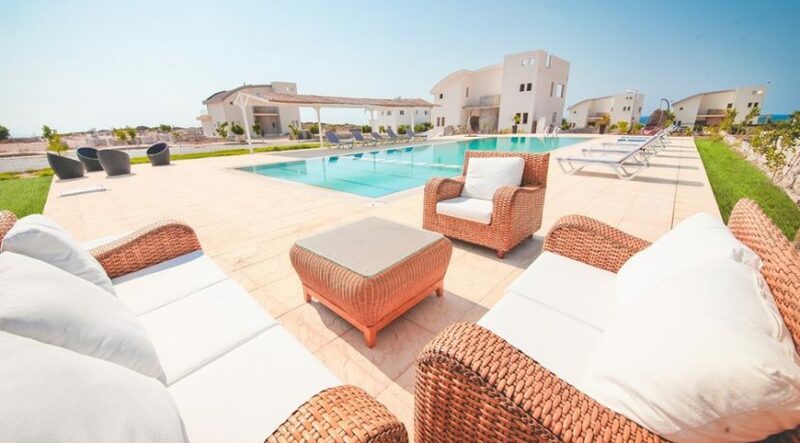 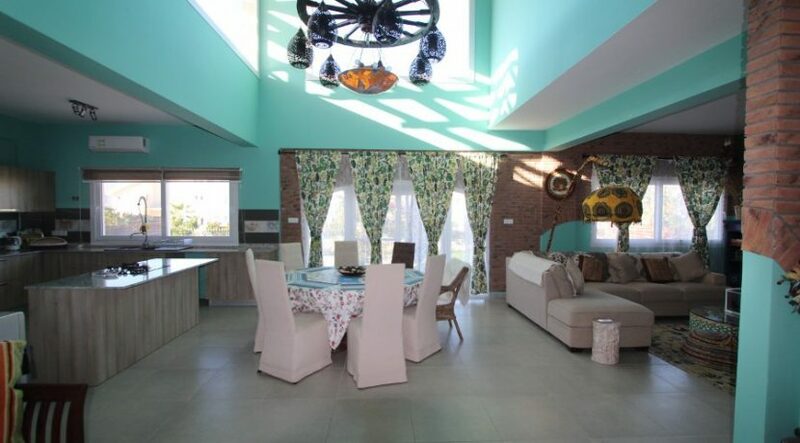 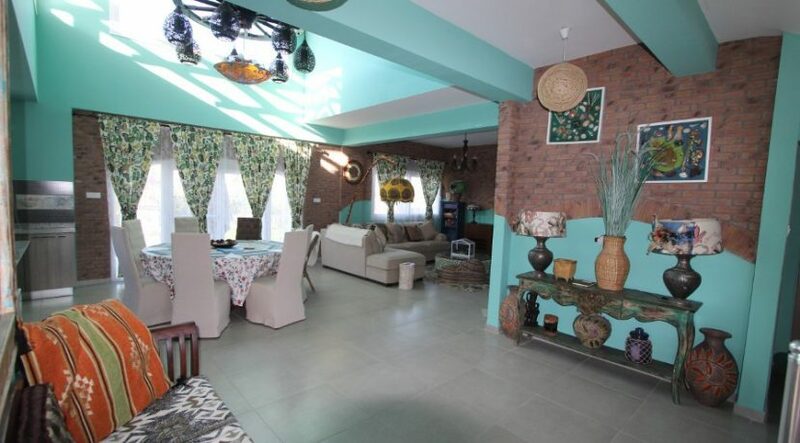 Overall, the fabulous views, spaciousness and design of this villa, combined with the interior quality and upgrades including fly-screens, wood-burner, brick feature walls, upgraded kitchen and bathrooms, render this North Cyprus property truly unique. 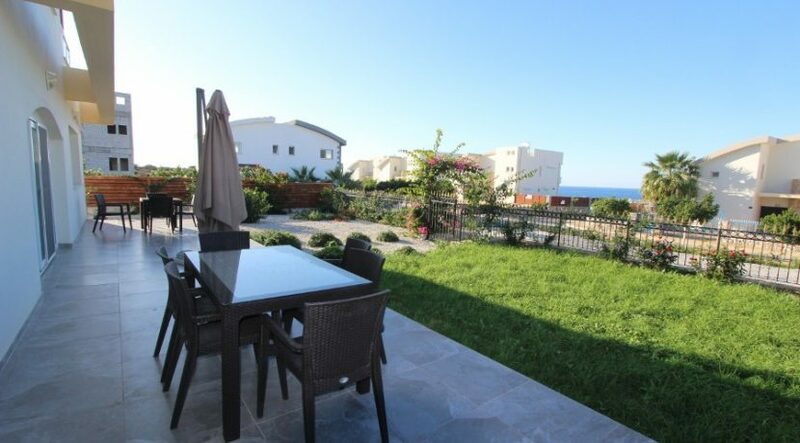 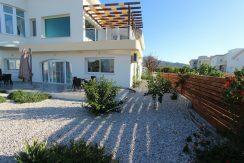 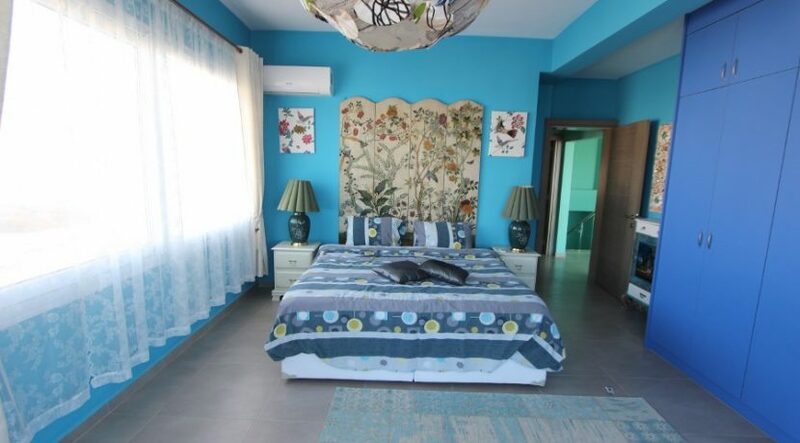 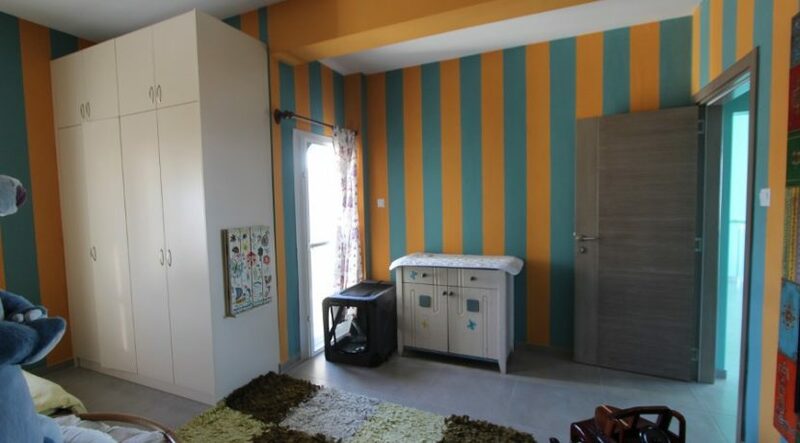 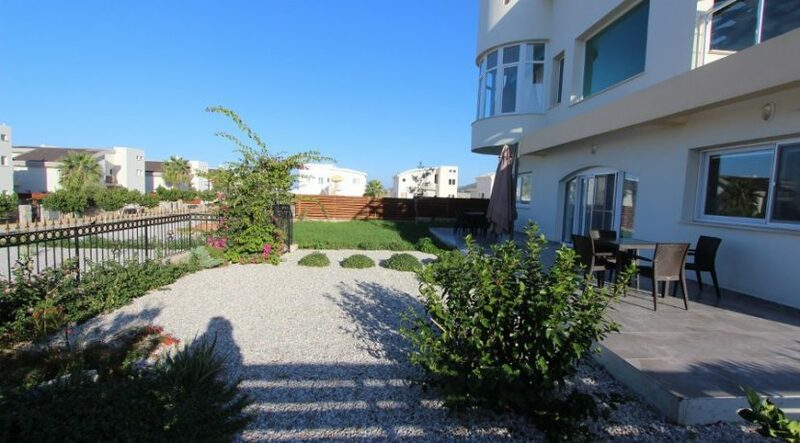 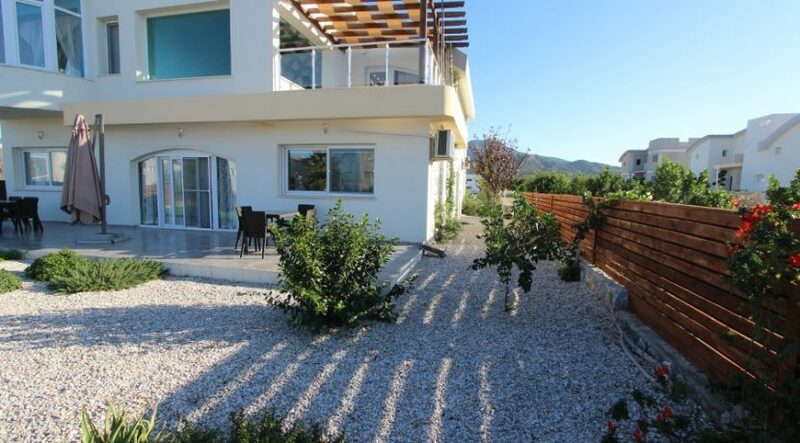 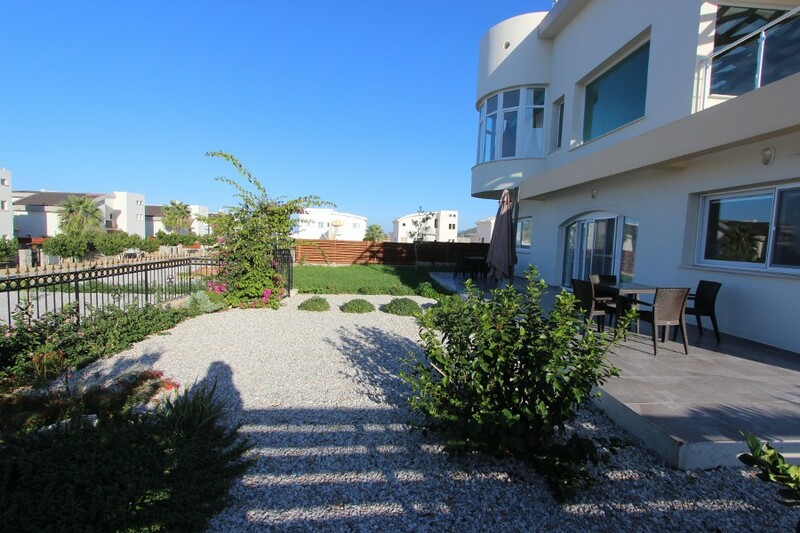 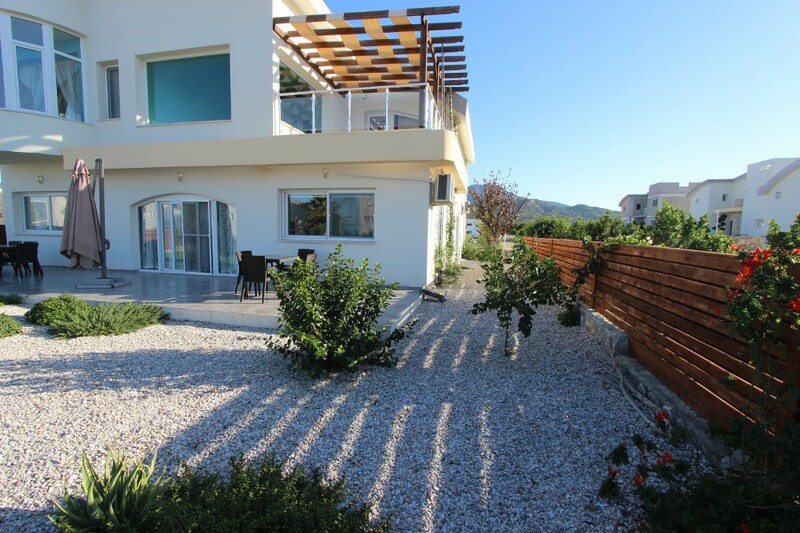 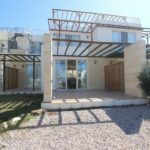 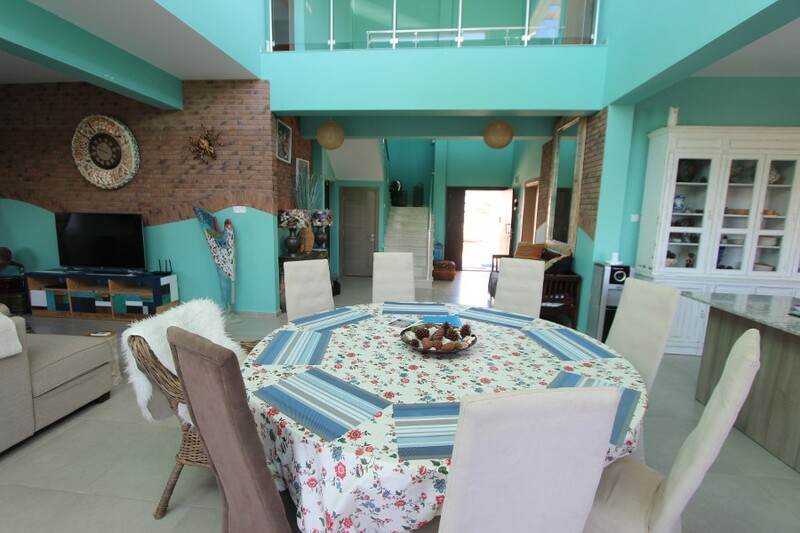 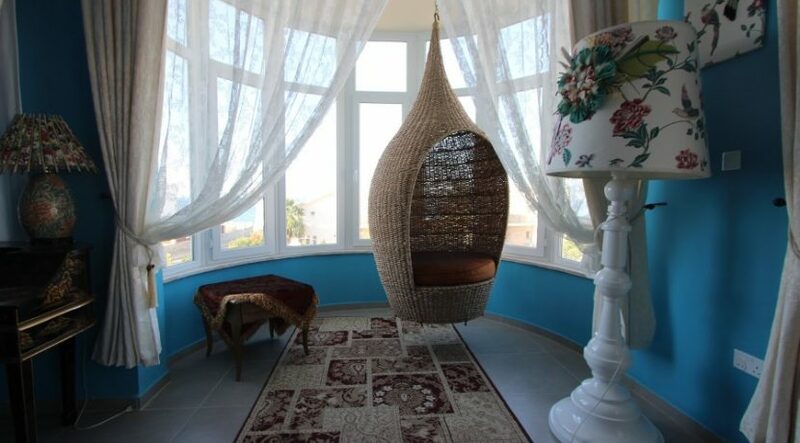 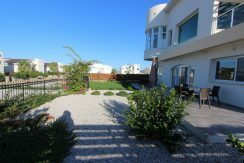 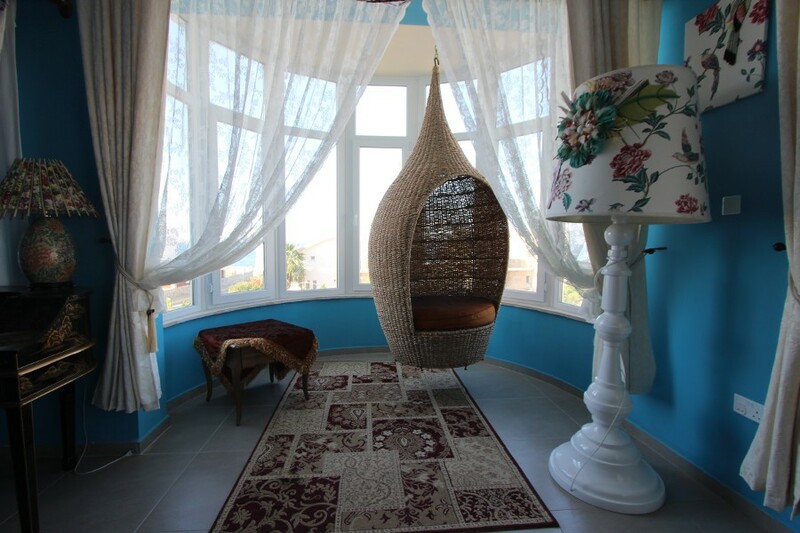 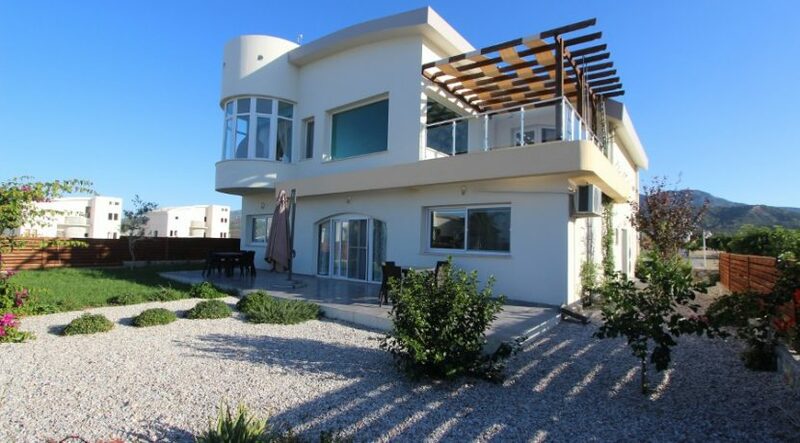 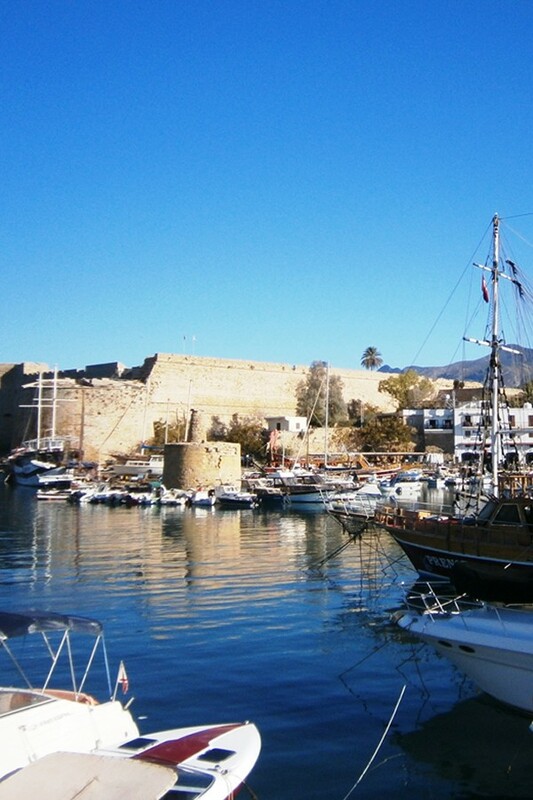 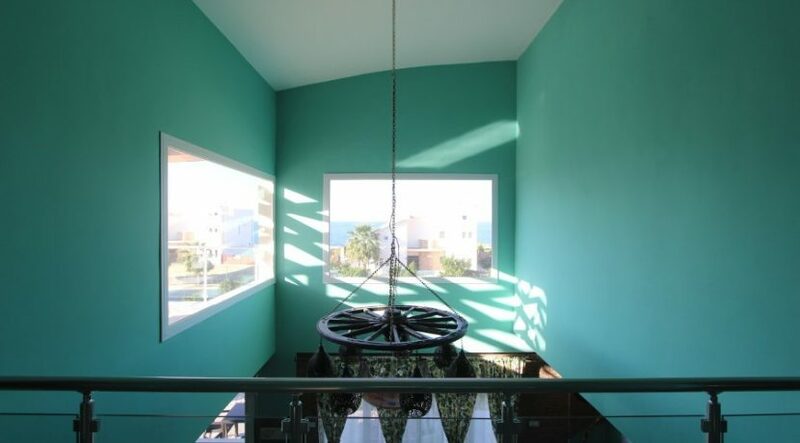 This lovely home is at the gateway to the Karpaz going east, with miles of sandy beaches plus the brand-new Karpaz gate Marina, yet also has easy access to Kyrenia/Esentepe/18 hole Golf course going west. 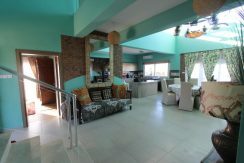 To the rear are unobstructed views of the Five Finger Mountains and you are just a short drive from local restaurants and shops. 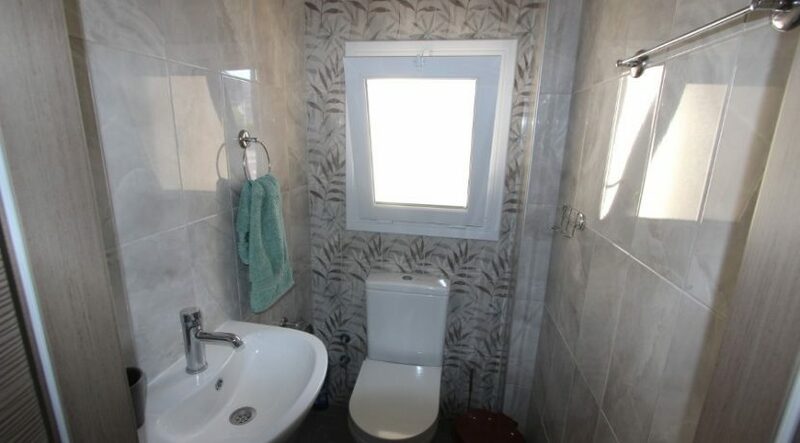 Details: Single Aspect (window with sea views), air con unit, floor tiles. 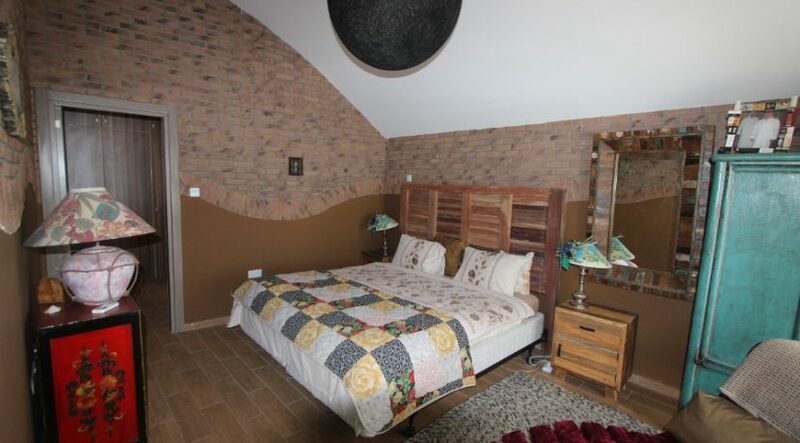 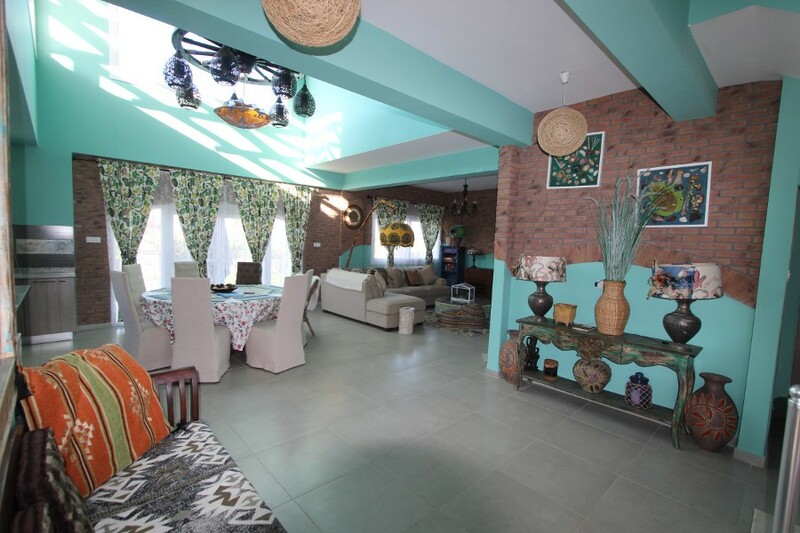 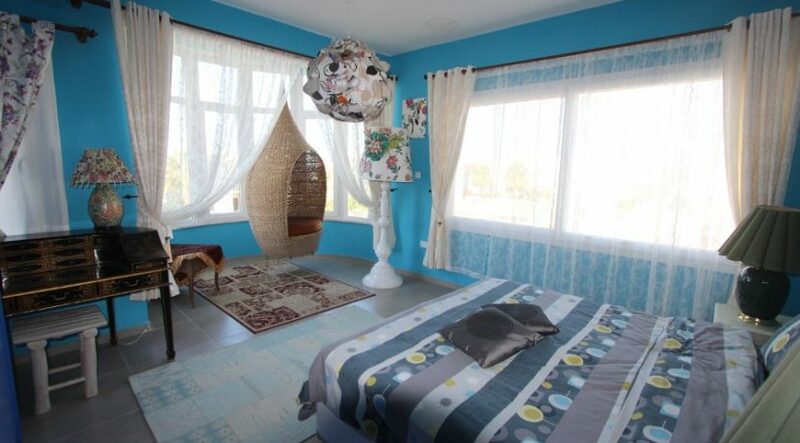 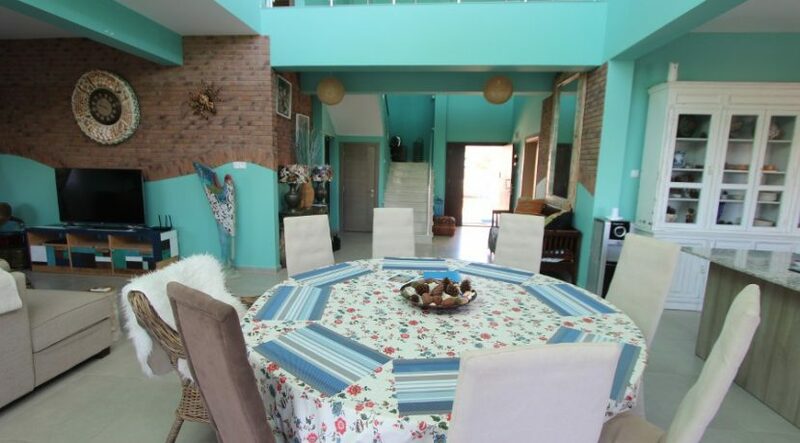 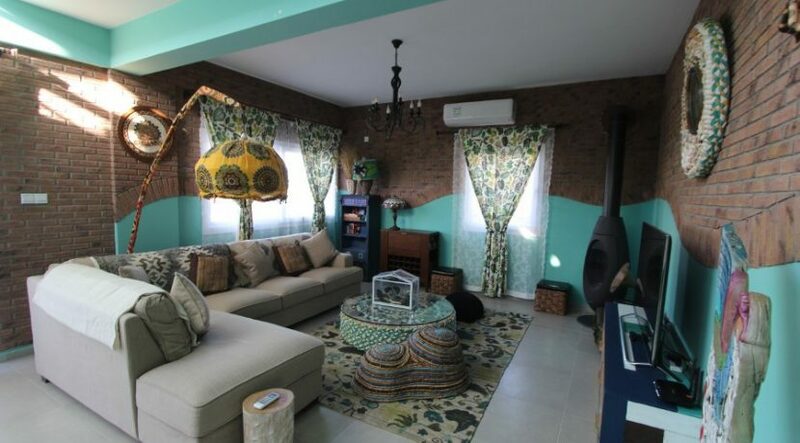 Details: Dual aspect (2 windows with sea views), air con unit, brick feature wall, floor tiles. 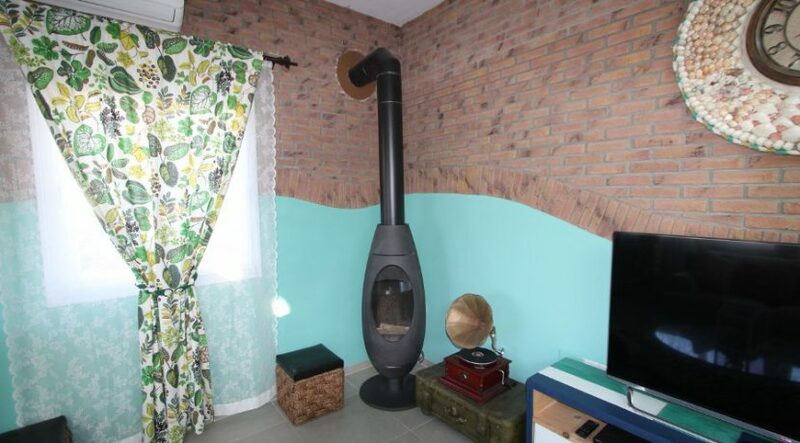 Details: Single aspect (large sliding doors leading to back garden with sea views), brick feature wall, floor tiles. Details: Single aspect, floor tiles. 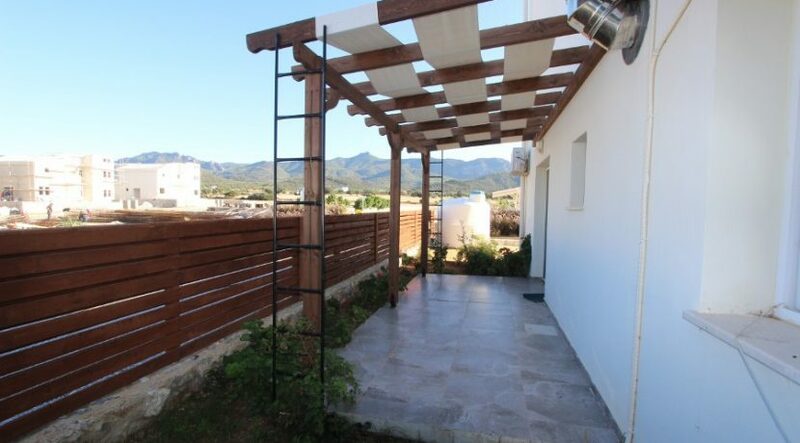 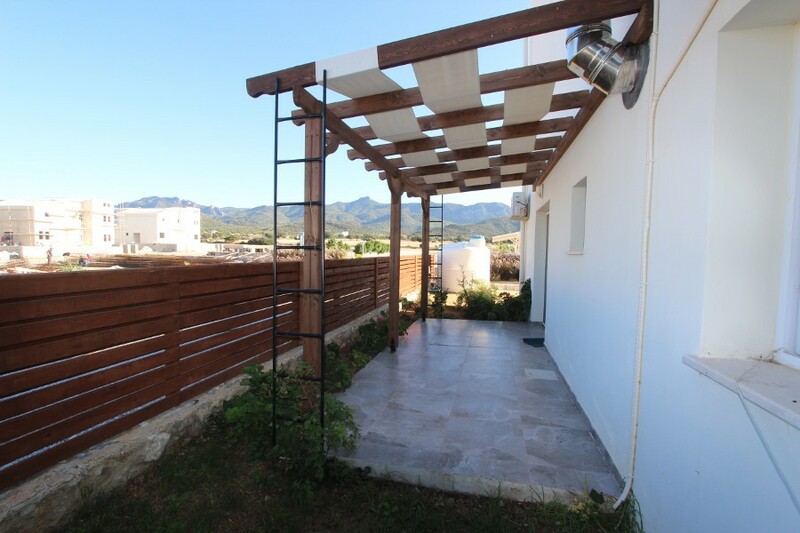 Details: Dual aspect (window with mountain views, door leading to terrace area with mountain views), air con unit, fitted wardrobes next to the en-suite, tiled floor. 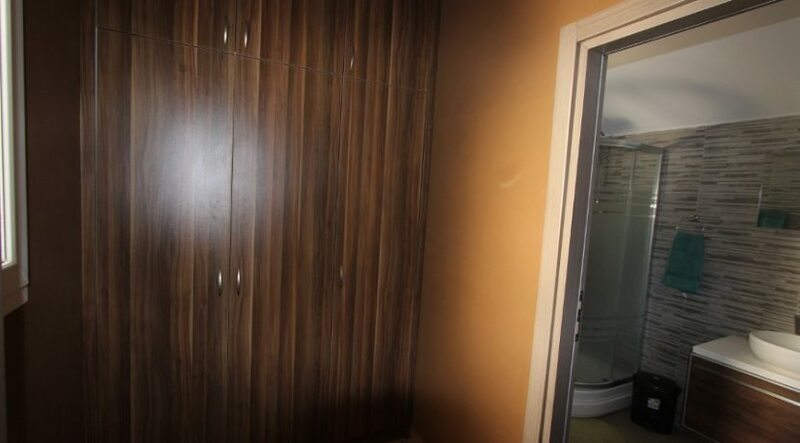 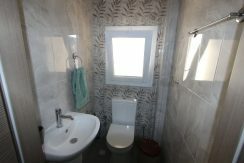 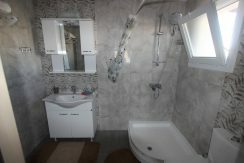 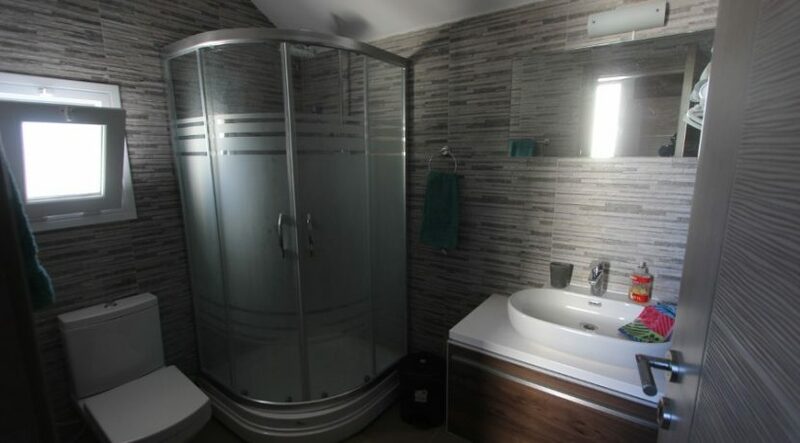 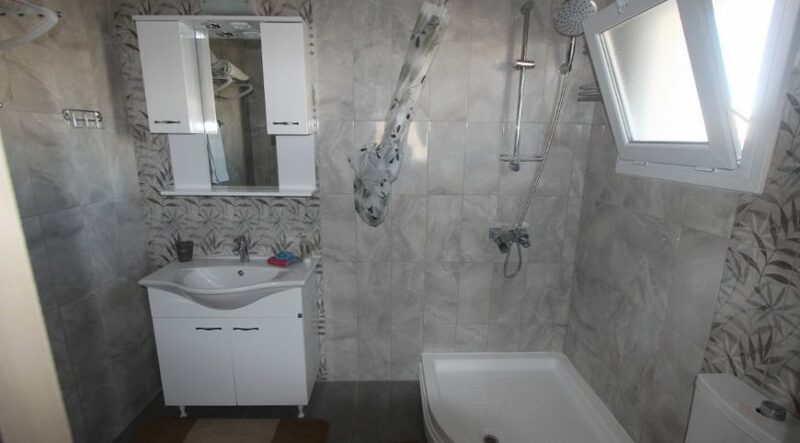 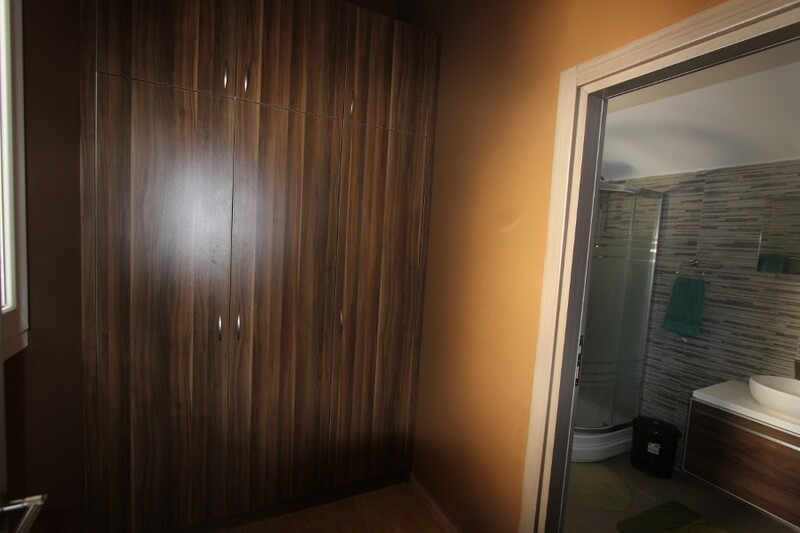 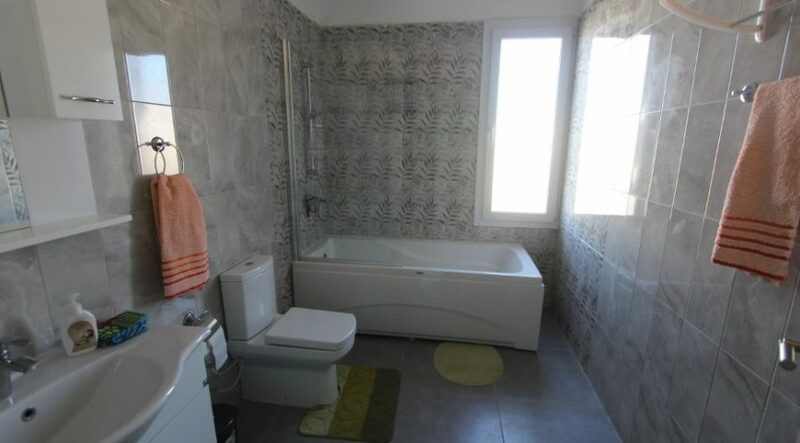 En-suite: Single aspect, shower, floor and wall tiles. 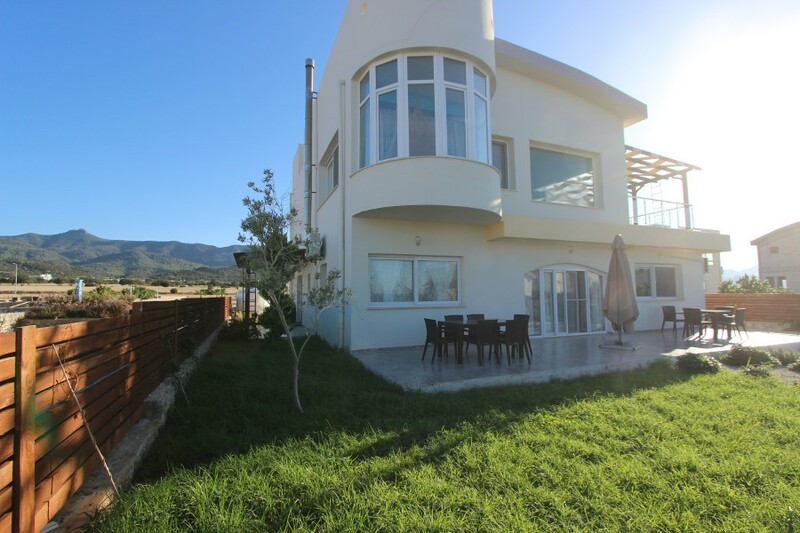 Details: Dual aspect (window with mountain views, sliding doors with sea and mountain views), air con unit, fitted wardrobes, floor tiles. 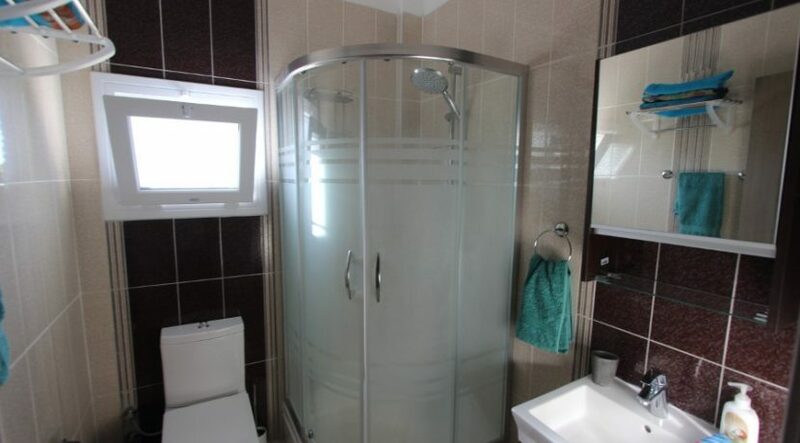 En-suite: Single aspect, shower, floor tiles. Details: Triple aspect (1 window with mountain view and 2 with sea views), bay window, air con unit, fitted wardrobes, floor tiles. 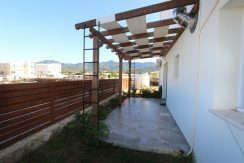 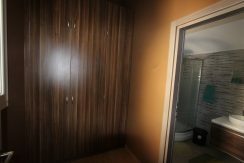 Details: Dual aspect (1 window with mountain view, 1 door to balcony with mountain views), air con unit, fitted wardrobes, floor and wall tiles. Details: Single aspect (large window with door leading to a large balcony with sea views), air con unit, fitted wardrobes (next to the en-suite), brick feature wall, floor tiles.